While interned as a German National at the Isle of Man during the WWI, Joe helped rehabilitate his fellow inmates who were sick. One of his methods was to remove springs from the hospital beds and turn them into resistance exercise tools for the bedridden. This inspired his use of springs in his exercise apparatus, and springs are still used in modern Pilates equipment today. Nice story, right? I love telling it to first-time Pilates clients as they nervously wide-eye all the equipment. The look on their face says it all: it’s easy to believe that the mad genius who created this set of torturous looking apparatus must have a very interesting story indeed. To bring Pilates and his equipment a little more down to earth, Benjamin shared his research on exercise equipment trends in the late 1800’s. We looked at pictures of wacky looking machinery of the era that purportedly brought health to the user. A few of these health devices focused on moving and stretching the body both actively and passively, and even looked similar to modern Pilates apparatus. However, those machines were made by Swedish physician Gustav Zander, who started his work more than 20 years before Joe Pilates was even born. Then, Benjamin talked about what was known about the creations of Joe Pilates. The first U.S. patent application from Joe Pilates was for the Foot Corrector. This was very pleasing news to me. If you’ve read my other posts, you know that feet are super important. Evidently, Mr Pilates thought so too. And guess what this first rendition of the Reformer didn’t have? Springs. It didn’t have springs! Instead, it had a pulley system with a cord attached to an adjustable weight stack. Since Benjamin’s workshop, I’ve done some online research on what life was like in the camps at the Isle of Man. The few written personal accounts definitely mention using palliasse (straw mattresses) on the floor. However, the infirmaries are described as having beds. Couldn’t it be that the infirmary had metal sprung beds with straw mattresses on top so the British doctors didn’t have to stoop to care for the inmates? After giving it some thought, I decided that yes, it is still plausible that Mr Pilates could have access to some sort of spring from a bed frame while in the internment camp at the Isle of Man during WWI. 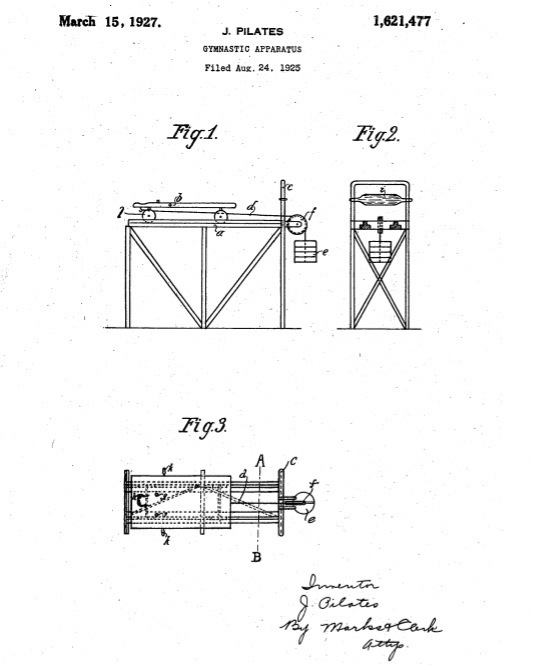 The 1925 patent application showing that Joe Pilates considered a cabled pulley system for his Reformer instead of springs is certainly noteworthy. However, it’s not enough to debunk the WWI bed spring story entirely. But does it really matter if Joe’s ideas for his apparatus were totally spontaneous and original, or if he was heavily influenced by earlier inventions of others? Unlikely creation stories help build a sense of infallibility to men and methods, and might discourage some students from asking questions. If you demagogue Joe Pilates and his method, you run the risk of not assessing his work for validity, for yourself and your clients. If Mr Pilates improved upon the work of others and had many delineations of his Universal Reformer, it would seem he understood the importance of continuous assessment, and wasn’t afraid to use it. Shouldn’t we all be this courageous? *This does not keep me from hoping Santa Claus shows up. This year, the new book Hubertus Joseph Pilates – The Biography by Esperanza Aparicio and Javier Perez Pont is on the top of my list!